So Cal Crawl Space Solutions solves crawl space moisture problems in greater Santa Barbara and surrounding areas in Camarillo, Ventura, Santa Barbara and more. Crawl Spaces are often ignored and can become huge problem areas for your home as moisture and humidity lead to mold, rot, and damaged insulation. 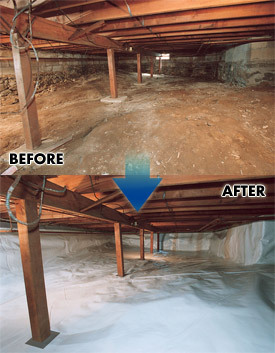 We can solve the problem for you by repairing the damage and then encapsulating and insulating your crawlspace. With patented products and years of experience we seal your crawl space adding dehumidification to prevent any mold growth or rot while at the same time adding insulation to keep your floor and home warm in the winter and cool in the summer. You don't have to deal with flooding in your basement any longer. 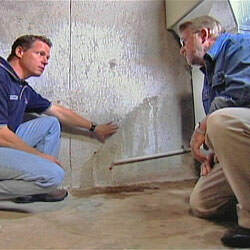 Our Expert team will install our patented drainage and sump pump system. The sump pump includes back up pumps and a backup battery to ensure your floor never gets wet. We work in both finished and unfinished systems and offer a transferable lifetime dry basement warranty! We can also refinish your basement with a large selection of waterproof, beautiful materials. After a disaster we are here to help relieve the burden and stress you are experiencing. With years of experience serving the community we are your solution after a disaster. If you've noticed mold in your home or business after a plumbing or roof leak, we have the training, equipment and expertise to handle your mold problem.